We could certainly use it out here Cirrus! A little bit of mist fell here about an hour ago. Only a trace of rain so far this month. Temperatures slightly above average overall. Last couple of days were about average. Dry times indeed. PAST 24 HOURS WEATHER...Slight to moderate overnight showers. 3mm yesterday here at Sunnybank Hills (midnight to midnight). Total so far for April 2019: 12 mm. Total so far for 2019 : 254 mm. (Exactly 10 inches). PAST 24 HOURS WEATHER...No significant weather. Still waiting for our first rain here in April. So far, only 2 days out of this year 2019 had any meaningful rain. A little over 4 inches for the year. 110mm. Mowed the lawn recently and experienced another dust bowl. Aside from that, the weather has been beautiful. No heat or AC needed. Nice time of year for sure. Yes, best time of the year. No sweating and no freezing. 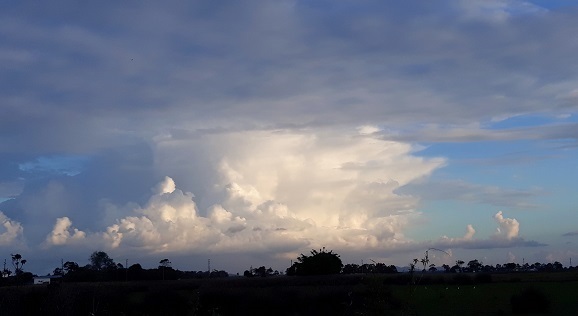 Although the official forecast currently has the very slight chance of a thunderstorm for SE QLD locations today (due to the passing cold air aloft causing some weak instability), I think it'll be a fine line between something and nothing at all. Even if any were to occur, I'd say it'd be pretty localised brief thunder/small hail and the majority of other locations would miss out. There'll probably still be some shower activity near the coast and islands initially although how far this shifts inland later today has a bit of uncertainty. Still looking like the possibility of some shower activity continuing through most of the Easter period although mainly near the coast. I will be visiting the GC over the easter weekend, will I be expecting a bit of shower activity? 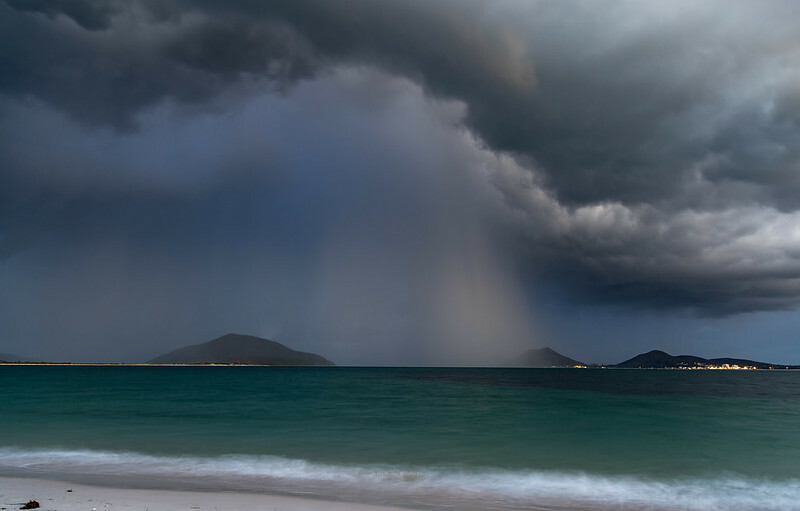 Awesome pic Eddy , yes showers forecast every day, until September the way things are going LOL. Thanks Gleno71. Anyway showers or no showers I will still be looking forward to being up there and having fun with the camera. Shower sitting just off the coast early this evening. It eventually moved northwards and ashore, bringing 5.4mm of rain here after sunset. The 7th rainday in a row here. Coffs getting some bulky showers this evening with 32mm there. PAST 24 HOURS WEATHER...Slight showers lunchtime Monday - no rain recorded. True evaporation measurements are rare. Evaporation measurements are often what was known as Class A pan evaporation and needed correction (pan factors) for open water evaporation to account the mass of the body of water in the pan heating up. Class A pan evaporation is still measured at not many locations but not published to my knowledge. What you may find useful are estimates of evaporation from other weather parameters. You can get estimates of open water evaporation, potential and actual evapo-transpiration (plants and evaporation depleting soil stores) from this page on the BoM website. The one you want for your pool is open water evaporation. Select your location and you can download the historical data you want. I work in the pool industry and the accepted method is to place a bucket of water beside the pool, mark the water level in both and check 24 hours later. The evapo-transpiration figures for the Maroochy airport are also a reasonable indicator of pool evaporation. If there is greater loss than just evaporation, and that stops once the water level is below the skimmer box, you can be reasonably confident the leak is in the plumbing between the pool and equipment. Just having a nice chunky shower at the moment.Looks like a nice feed from the SE. Generated in 0.049 seconds in which 0.029 seconds were spent on a total of 14 queries. Zlib compression disabled.